Developing Juniors is our passion. 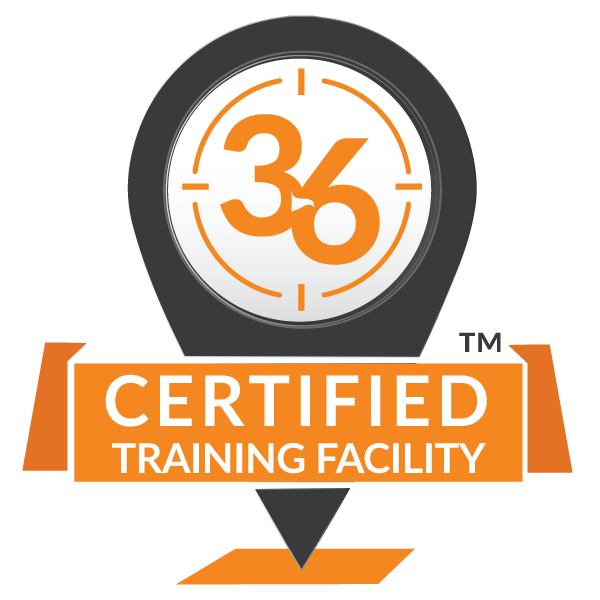 Operation 36 is one of the fastest growing group coaching program in the world, now being ran at over 350 facilities across the US, Canada, UK, and Australia. It is a 6 level program that is designed to progress golfers to shoot par or better for 9 holes based on learning, training and playing! Creating a Fun learning environment is the focus of all our player development programming. From our youngest beginners through to our elite juniors coaches emphasize long term skill development over technique to improve performance. Golf is a game to be played and as such giving juniors the tools to score consistently well is vital. Utilizing the Operation 36 principles juniors learn to score par from 25yds then progress back in distance as skill acquisition increases. The scoring centric approach allows juniors to develop their own unique technique which will aid them in consistently shooting lower scores. When enrolling in an Operation 36 Program you will get a custom profile to keep track of your progress. It is here you can view all of your playing stats, training stats, and also see which Operation 36 or Custom Objectives that you are working towards. You can view your current Operation 36 Objectives in the mobile app. Your coach will teach and test you on those objectives and mark complete when you have mastered it. After you complete each objective you will unlock new ones. 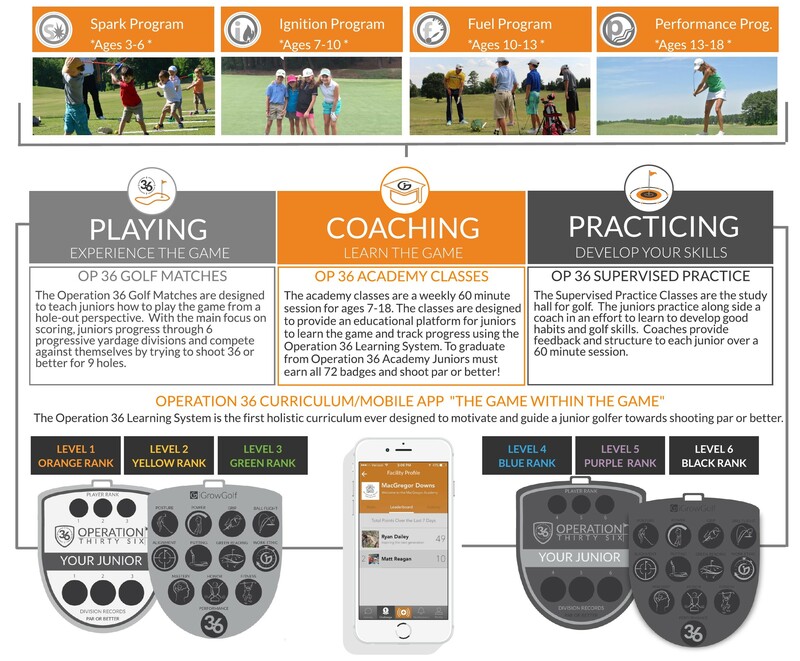 You can also view custom objectives your coach sets for you in private lessons. 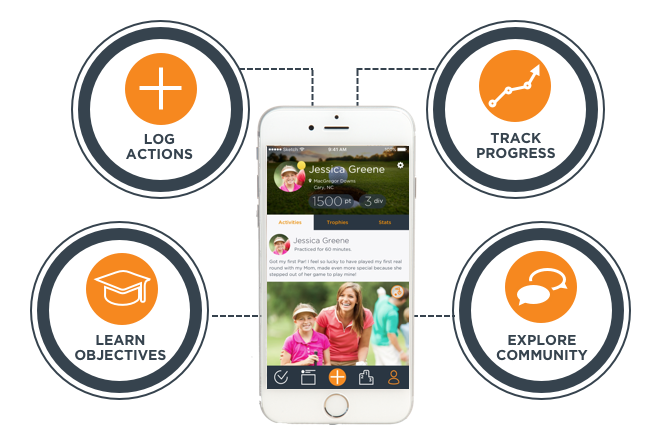 The center of the app allows you to log all of your actions you are taking to improve your game. Log playing, training, and social actions on the app to earn points and move up your community leaderboard. Encourage your friends by liking and commenting in the activity feed! CHAT TO US ABOUT GETTING YOUR CHILD INTO A SAFE LONG TERM SPORT THAT TEACHES LIFE SKILLS AND ETTIQUETTE.